Togu Audio Line has released some excellent free plugins down the years, so we've every reason to suspect that its new release, TAL-Reverb-4, will be worth checking out. Promising a 'modulated vintage reverb sound', this is a standalone version of the reverb unit in the company's new TAL-Sampler, and is said to be designed for use on all kinds of audio material. What's more, with its simple control set, it should be pretty easy to use. 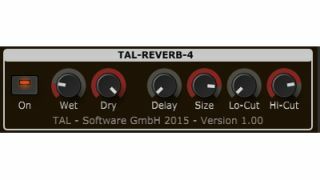 You can download TAL-Reverb-4 now in VST/AU/AAX formats for PC and Mac (32- and 64-bit hosts are supported). It's available on the Togu Audio Line website.